Today is one of those days when I must let the art speak for itself, week three of our RE: series; re-imagine. Today’s is a simple, but significant message, with multiple scripture references. 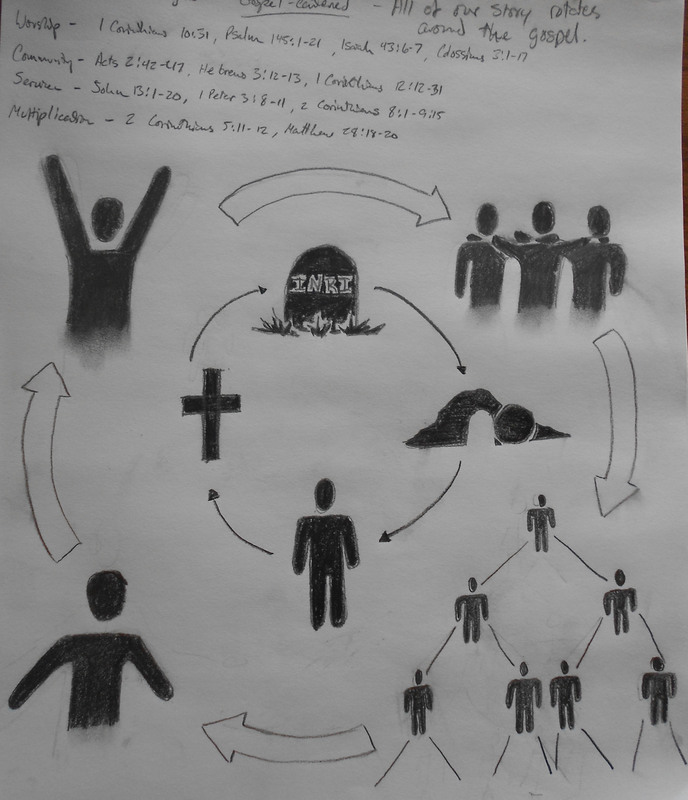 All of our story, as the church and as people, rotates around the gospel. Every decision, every motive, every ounce of compassion is driven by its principles. The gospel is simply this, Jesus is God in the flesh, he lived, he died, he was buried, then rose from the grave and continues to live today. I represent the gospel in the central part of today’s drawing; a simple figure, a cross, a gravestone, and an empty tomb, each symbol guided to the next. Surrounding the gospel icons are images that represent the main focuses of us (North Ridge) as a church, the defining features of every gospel-centered church. Starting in the top left, gospel-centered worship; intentionally focusing all our attention to making much of God. Next, gospel-centered community. Navigating life together as a body of believers. Moving to the bottom right, gospel-centered multiplication. This is an image of evangelism, but not the over-spiritualized brow-beating kind the media and overly zealous display for us. This multiplication is a banding together of people who look past each other’s failures to maximize each other’s potential. Broken people reaching out to other broken people to make them part of a community that reflects God. Fourth in the rotation is gospel-centered service. Motivation matters. When the gospel is central, serving is driven by genuine compassion for humanity and a love for all creation for the sake of magnifying the Creator. These four pillars of Christian life orbit around the gospel. When just one element of the rotation goes unfulfilled, the cycle is broken and the wheel cannot turn smoothly. How does your life measure up in this cycle? In which areas area you doing well and which need re-inflation to make the ride a little smoother? All of our story rotates around the gospel. Next week’s message, re-launch. North Ridge, prepare for ignition.